Ever since we moved to this new house, we had more space for decors like a 6-foot Christmas tree. The dogs no longer have the run of the house, so Marc allowed me to buy a tree that would be the centerpiece of our living room. Marc knows how sentimental I am over Christmas trees. He got me Christmas garlands when we first got married since our old tiny house was too small for a tree, and even allowed me to buy decorations for the little tree my aunt gave us for Christmas last year. Though our private space in this house is still small, the common living room area is spacious enough to accommodate the 6-foot tree. My sister and I had a blast putting up the treeâ€”my mom watching us work, while my dad and Marc occasionally gave decorating suggestions. I accidentally disconnected a strand of Christmas lightsâ€”good thing Dad was able to put it back into place. When we were done, we turned out the living room lights and just let the tree shine. I felt like I was a kid again, eagerly waiting for Christmas day to come. How about you? 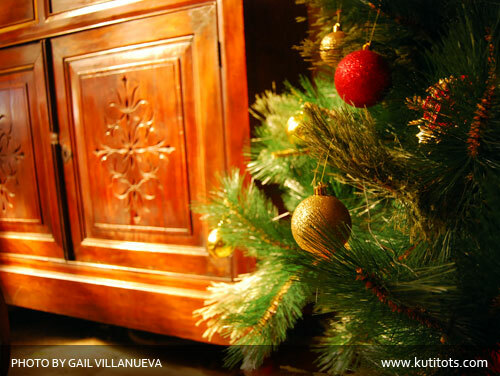 Have you put up your Christmas decors yet? This entry was posted on Tuesday, 2 December 2008 at 3:17 pm and is filed under Holidays, Musings, My Family. there is something about christmas decorating that brings out the christmas spirit. November 15 pa ako…but i lighted everything just yesterday. My parents had the decorations on since November. Though I was never really into putting up Christmas decorations, it’s always nice to see my family sit down and do something fun and relaxing. I love decorating my home with Christmas flowers! They are so festive and brighten up my den!